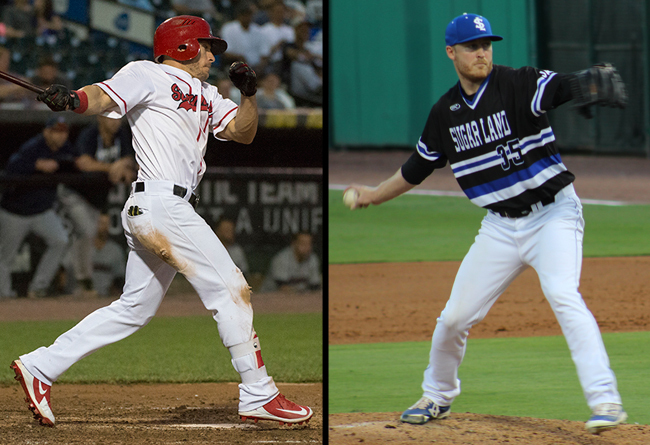 (Lancaster, Pa., July 6, 2018) – The Atlantic League of Professional Baseball Clubs (ALPB) today announced the recipients of the league’s Player and Pitcher of the Month awards for June of 2018. Lancaster Barnstormers outfielder Blake Gailen has been named the Atlantic League’s Player of the Month. The seventh-year Barnstormer showcased tremendous power during the month, launching nine of his 13 home runs on the season. Additionally, he totaled 26 runs batted in, 17 runs scored, 35 hits, six doubles, 19 walks and eight stolen bases. In his 28 games played, the 33-year-old compiled a .435 on-base percentage and a .654 slugging percentage. Additionally, Gailen a 16-game hitting streak from June 9-26 and a 24-game on-base streak from June 1-26, both of which are the second-longest streaks of their kind in the Atlantic League this season. Sugar Land Skeeters starting pitcher Dallas Beeler has been selected as the Atlantic League’s Pitcher of the Month. The right-hander posted a perfect 5-0 record in his six starts along with a miniscule 1.60 ERA. In 39 and one-third innings of work, he allowed just seven earned runs on 22 hits and eight walks while striking out 33 batters. Opponents batted just .159 against the 29-year-old in June, as he helped lead Sugar Land to the First Half Freedom Division title. Beeler gave up three runs or less in each of his six starts and struck out five or more batters in five of the six outings. His month culminated with eight innings of no-hit baseball on June 30 against Lancaster in a 4-0 victory.